This is just one example of a misinformed conversation I overheard this summer regarding the Paleo diet, also known as the Caveman diet. The premise of the diet is to reduce the risk of chronic diseases, including heart disease, Type 2 Diabetes, and obesity, by eating like hunters and gatherers did 10,000 years ago. While the Paleo diet has been all the buzz this summer, many followers have not taken the time to educate themselves on the basis or purpose of the diet. For instance, from the example above, fat is not a food group included on MyPlate, which is the current nutrition guide published by the United States Department of Agriculture. 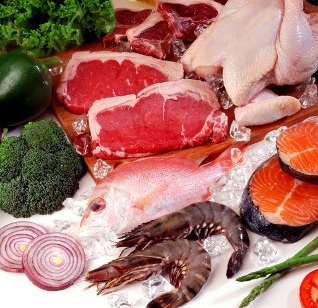 Additionally, the increased fat in the Paleo diet should not be mainly from high-fat meats. Rather, the increase in fat should come from monounsaturated fat sources (olive oils, avocados, nuts and seeds) and Omega-3 fatty acids (salmon, mackerel, herring, walnuts). The Paleo diet likely exceeds the Dietary Reference Intake’s (DRI) highest recommended daily caloric fat intake of 35%. The DRI is a system of nutrition recommendations from the Institute of Medicine. Whole grains and legumes, found in many studies to be protective of cardiovascular disease and Type 2 Diabetes due to their high fiber content, are excluded. Daily calories from carbohydrates in the Paleo diet likely fall below the recommended 45-65% with the exclusion of grains, legumes, potatoes, squash and corn. Did I mention carbohydrates are the body’s main source of fuel? The entire dairy food group is eliminated, which provides a significant source of Vitamin D from milk and calcium. Non-dairy sources of calcium include dark green leafy vegetables, which are allowed in the Paleo Diet. A Calcium and Vitamin D supplement is suggested to meet the Dietary Reference Intakes’ recommendations. It’s impossible to mimic what our ancestors ate as we no longer spend our days hunting wild animals and gathering plant-based food for our meals. Organic produce, wild-caught fish and grass-fed meats best mimic the nutrition quality of foods consumed long ago. The increased cost, limited variety, and structure of the Paleo diet make it less sustainable. If this seems impractical to follow for a lifetime, why follow it in the present? With any diet, it’s important to conduct research with credible sources and consult a registered dietitian or doctor before making drastic dietary changes instead of following a trend. As a registered dietitian, I believe the key to a healthy lifestyle is a well-balanced diet full of a variety of fruits and vegetables, low-fat dairy, lean meat, plant-based protein sources and moderation in whole grain carbohydrates. This sound advice may not be as catchy as eating like a caveman, but research-based decision making is more ancient than the Paleo diet itself. Brittany is a registered dietitian and has been with Food & Friends since October 2012. Her previous experience was working as a clinical dietitian on the pediatric hematology and oncology unit at Children’s National Medical Center. Brittany completed her dietetic internship in Baltimore, Maryland, through Sodexo-Mid Atlantic and is a graduate of Bluffton University in Ohio. She enjoys traveling, playing tennis and softball, making crafts, and has a new found love for leading cooking class. Learn more about Food & Friends' nutrition services.